You know how in a lot of families there are ways of describing favorite things? When something is ‘awesome’, ‘sweet’, ‘unbelievable’ or even the ‘bee’s knees’–that’s a vote of confidence and an affirmation as in… “Hey Jake, your drum work is just rad!” or “Gauche, you’re just the bee’s knees!’ or “The special effects in Avatar were way cool!” In my family, when something was really, really “Over the top!” we attached the phrase “World’s Fair” to it as a tip of the hat to the national expositions that took place in many countries around the world. When I would ask my mom, “Are you making the World’s Fair cheesecake?” we both knew that it was a favorite, took a lot of time and attention, and, well, frankly, was worthy of international attention. I call this World’s Fair Granola for those reasons. There are a million granola recipes out there, and this is just one more. But I think you’ll agree that it’s really a good one in a million. 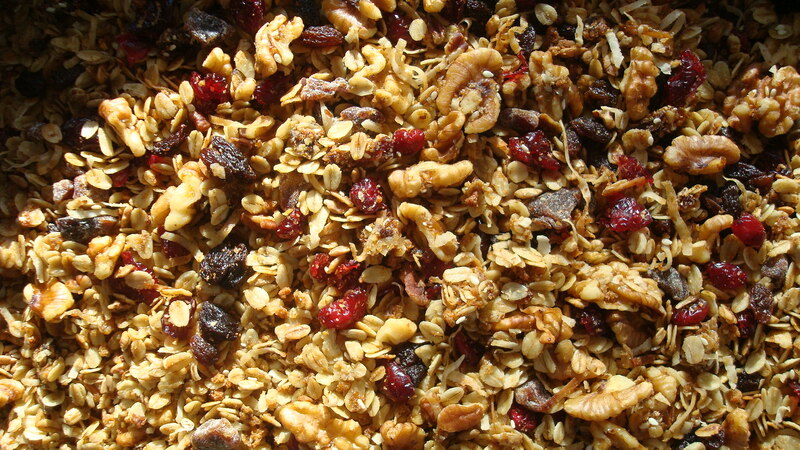 Whenever I head out of town to the Boundary Waters, a camping trip or on a writing break, I ask my sweet bride to “make a batch of World’s Fair Granola.” It travels well and there’s a ton of yummy stuff in it. Taste and see for yourself. Note: This makes a bunch; really a lot. So, you could easily cut this in half and still be eating it for a week. Halving it makes about 10-15 cups. Either way, enjoy! Various dried fruits, raisins, craisins, etc. Melt the oil and margarine in a large roasting pan. Add the molasses, vanilla, brown sugar and salt and combine well. Cool slightly, then add remaining ingredients and stir thoroughly. Bake in the oven for a total of 20-25 minutes, stirring every 5 minutes. Granola should be golden brown. Remove from the oven and let it cool, then add raisins or craisins, or any other dried fruits you like. Store in an air tight jar or zip lock bags.